I’ve been working with Files, Blobs and DataURIs recently, and have found the whole thing just very confusing. What is the difference between the three, and how do the various methods around them work (createObjectURL, readAsDataURL and the various FileReader methods). We’ll be talking about files here. My initial impression was that files needed to be uploaded to a server for anything useful to happen with them. Turns out, that’s just plain wrong. Remember, all this can be done ENTIRELY client-side. Once a user selects a file using the ‘Browse’ button, the change event is triggered. As soon as that’s done, we show the image. Pretty simple, huh? Works entirely offline too. When you’re handing someone a glass of water, you just - well - give it to them. Similarly, you can hand <img> tags a DataURI and it would just display it like it’s a normal URL — without searching for the image or making an external HTTP call. That’s not how it works with a lake though. You don’t just hand someone a lake. When you want someone to go see a lake, you send them directions to it. 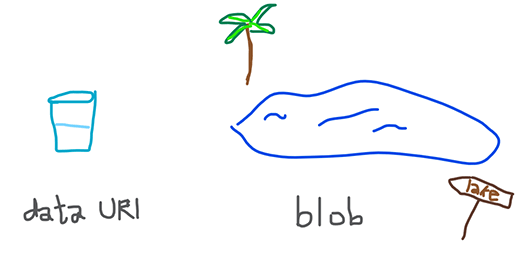 Similarly when you want someone to see a Blob, you don’t just add the Blob directly in the <img> or <a href="...">. You have to give it an Object URL first, using createObjectURL (that we saw earlier). The 36 character long hex string is just a pointer that points to our Blob. It’s only valid while the document is loaded, so if you were to refresh the page and set the same Object URL to an image you create, it just wouldn’t work. There’s alot here that I haven’t covered, and so I’m sharing some references below if you’re curious to learn more.